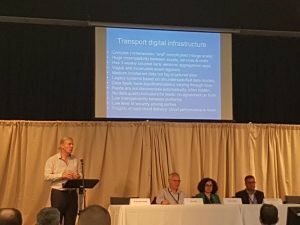 At the Digital Transport Exchange conference last week our own Jonathan Raper lead a session in which he asked us to collaboratively develop predictions for digital transport infrastructure, framing it as comparable to the building of the railways, and the various phases of development that went through. The railways went through a period of having many private companies poorly or chaotically interoperating, before later consolidating with phases of greater or lesser government intervention. Will digital infrastructure follow a similar path? What’s the most preferable outcome and can we direct things towards that path, and if so, who can lead this process? 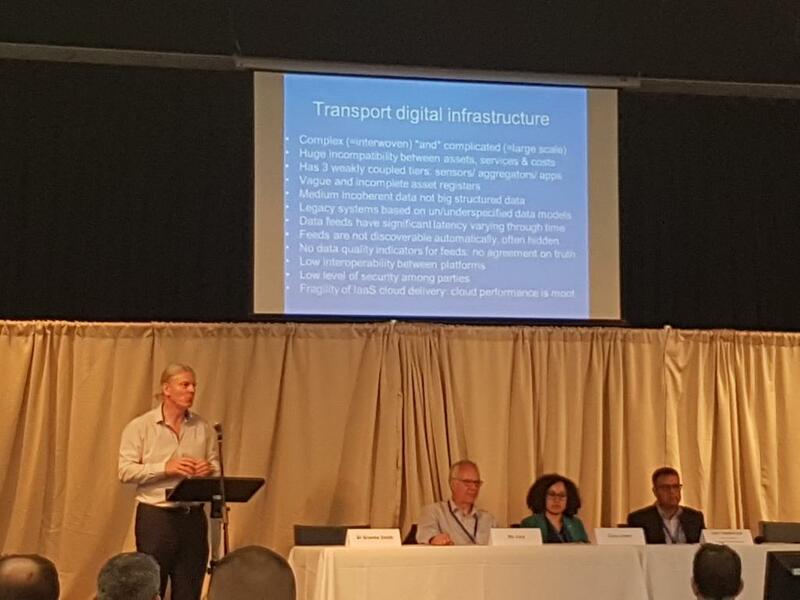 Jonathan picked up on the theme of “digital infrastructure” for his presentation on day two. 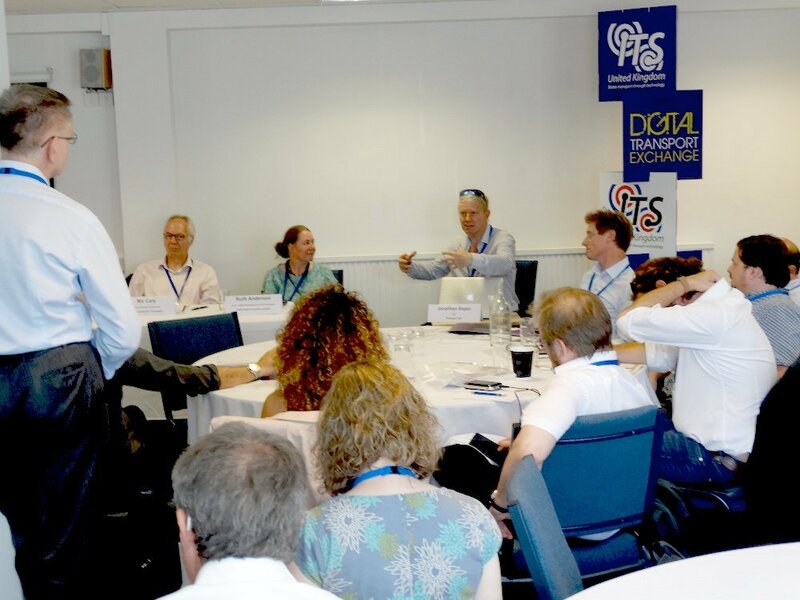 The format of brainstorming sessions lead by panelists, but also drawing thoughts from the crowd, seemed to work well with this knowledgeable group of industry data producers, consumers and stakeholders. In one session we listed perceived problems in the digital transport space, and then asked more cheekily “whose job is it to fix it”? Hearing some recurring problem statements, it struck me that open source, open standards and open data could be part of the solution a lot of the time. For example, if standards compliance is a problem, then open standards with open source validation tools can be an excellent solution. If government procurement is a problem, then more open source development (perhaps insisted upon at procurement time) would help see taxpayer money delivering real value. This would be especially true of local councils, where the same software problems are solved over and over with public money. In this connection it was great to hear from Giles Bailey, CEO of travelspirit who are spearheading a push in the direction of more open source software in our industry. The vast majority of our data comes from free open data sources, and we pass it on without adding any onerous restrictions (read more about our data sources on our credits page). This is very much a deliberate choice on our part, and we’re proud to serve as an example of a business built on open data principles. You don’t even need to sign up to use our API. For our most open API offering yet, you can use TransportAPI via Future Cities Catapult. This blog post gives more details. Their completely free and open instance of TransportAPI is available to everyone to use, for experimental projects and proof of concept work, particularly if you have interesting smart cities or urban planning uses in mind. This is an Enterprise service whose data is available on the CC-BY licence and that only has limits set by the server size and for some upstream chargeable information that has a daily limit for all users. Although we recognise there are ways we could be more open, within our industry we are proud to be recognised as pioneers of various open approaches.